The TRUBLUE 2 Auto Belay is the next generation of indoor and outdoor climbing wall auto belays. Designed specifically for the climbing industry, TRUBLUE uses technology superior to prior and current auto belay devices. 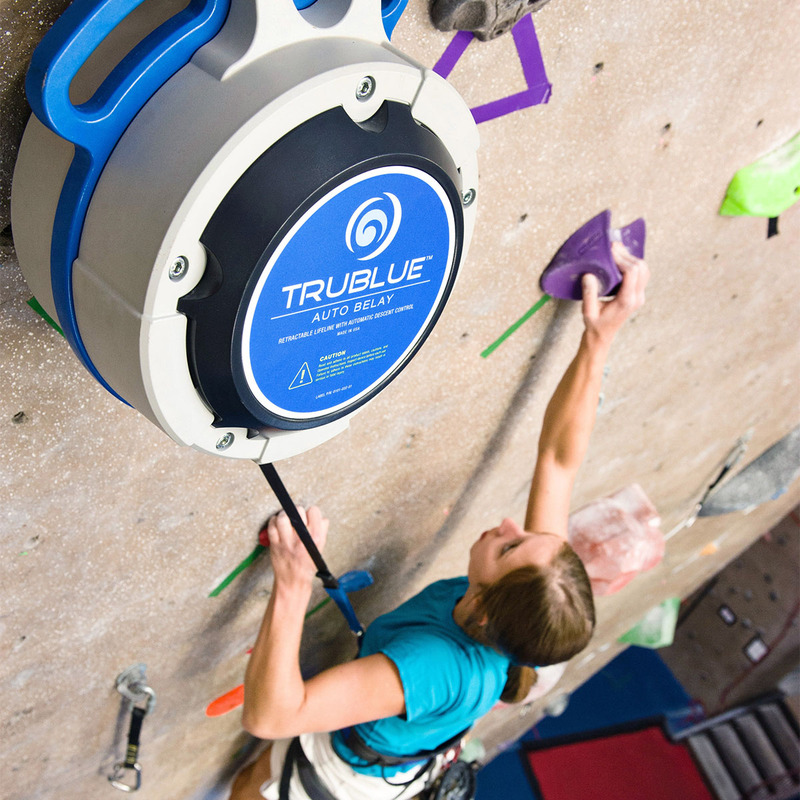 The TRUBLUE Auto Belay is the next generation of indoor and outdoor climbing wall auto belays. Designed specifically for the climbing industry, TRUBLUE uses technology superior to prior and current auto belay devices. TRUBLUE’s self-regulating magnetic braking system is the result of over four years of research, development and testing. Our auto belay is designed for climbers and engineered for safety. Our auto belays are engineered to meet the strictest safety standards of all auto belays. Plus, TRUBLUE auto belays have undergone extensive testing by an ISO 17025 certified lab specializing in product safety testing. The 7.5 m webbing length provides a slower descent for shorter walls. When ordering your unit, please select the appropriate length for your climbing wall height. We deliver the TRUBLUE unit with 2 Edelrid steel triple-lock carabiners (50kN). Smooth descent: The self-regulating braking system has minimal variation in the descent rate of a child (at 22 lb/10 kg min.) and an adult (at 330 lb/150 kg max). Meets international safety standards: TRUBLUE is designed for climbers and engineered for safety. We engineered TRUBLUE to meet international safety standards for fall arrest devices. 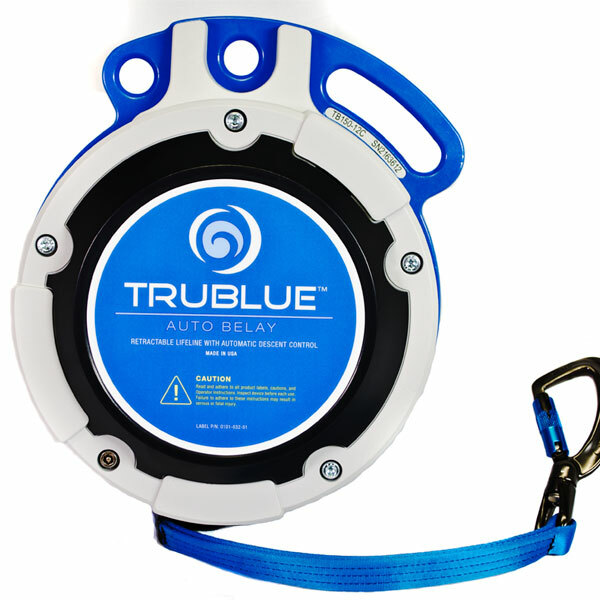 Extensive safety testing: For over four years, the TRUBLUE auto belay has undergone extensive safety testing by an ISO 17025 accredited company specializing in product testing. No clutch bearing: The TRUBLUE has been engineered to eliminate the need for one-way clutch bearings. This eliminates a key potential point of failure that is present in other auto belay designs, as well as the need to maintain and replace these mechanisms. Gentle whirring noise: Our auto belay makes a gentle whirring noise as the climber descends, alerting those below of a descending climber. Simple to install and easy to relocate: Compact modular unit designed to be hung from a top anchor. Just one step and no cost. Units can be moved to accommodate classes, birthday parties and other group activities, reducing staffing costs. Maximum descent height of 41 feet (12.5 m): Provides the longest range of all modular systems. Accommodates a wide range of climber weights: The TRUBLUE allows for a weight range of 22 – 330 lbs (10 to 150 kg), making it the ideal auto belay system for facilities with a wide audience of children and adults. Webbing based system: Will not damage walls like cable-based systems can. Plus, webbing is preferred by climbers over cable for its more natural feel. Reduced webbing wear: Unique field-replaceable webbing delivery nozzle significantly reduces webbing wear. Minimal Maintenance: Webbing replacement for the TRUBLUE is significantly less expensive than cable replacement for other types of auto belays. Low cost of ownership: An annual re-certification inspection is required with a low cost of $199. The TRUBLUE has no limit on the number of cycles before annual re-certification. Because they are modular, TRUBLUE units can be sent to our servicing center should they need repair, saving you money on costly site visits for stationary/fixed auto belays.